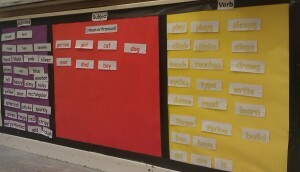 Every classroom in my school has to have a VCOP display. 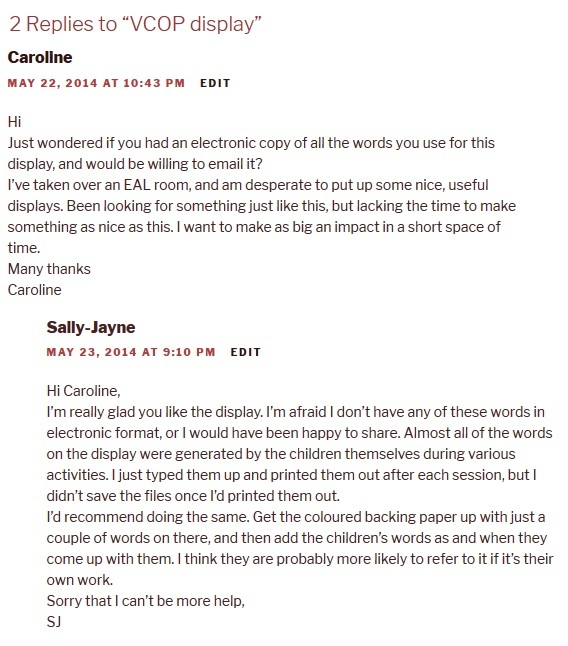 In fact as a supply teacher I’ve been in a lot of classrooms, and every single one of them has had a VCOP display, so I’m assuming it’s something on Ofsted’s ticklist. Now don’t get me wrong – I like VCOP. I know it has a lot of opponents, but I find it a very useful teaching tool, and like every tool its success depends on how you use it. I’m not a big fan of taking it out of context and treating it as four separate elements that children have to shoehorn into their writing, and to me a VCOP display does that. This display is my solution. My children are Deaf and for many of them BSL is their first language. They find English sentence structure difficult, so I have put up this display to demonstrate the structure of a standard English sentence. It would work equally well for EAL and EFL students, and I’m sure it could also be adapted for the MFL classroom, although I haven’t tried that yet. I have my Openers at the beginning of the sentence, where they belong, and my Punctuation at the end, also where it belongs. Connectives are underneath punctuation, to show that they are used to join two sentences together. 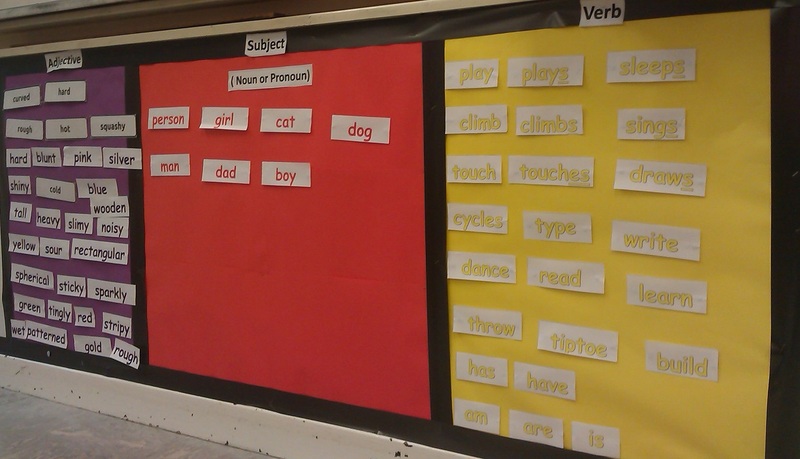 Vocabulary is spread over four panels – Nouns (subject and object), Verbs and Adjectives. Like everything with teaching, once you’ve done it, you think of a better way to do it, and next time I’ll move the adjective panel to just before the object instead of just before the subject. I think adjectives are probably used more to describe the subject than object, and it means that I could also have a S V A structure (The rose is pink) in the middle of the longer structure. It’s still a work in progress and I do plan to split the subject panel into nouns and pronouns, and the white panel needs an “or number” halfway down. Other than that, I’m quite happy with it so far. In addition to providing them with a standard structure sentence, it is exposing them to grammatical terms, and already one of the boys in the class has asked what the word “article” means and what it’s for. So there you have it. Nobody can accuse me of not having a VCOP display in my classroom, but I’ve managed to turn it into something more useful.